A new streaming television service from Net2TV called Portico looks to offer another video streaming alternative for consumers. The advertiser-supported, cloud-based streaming television service will include programming from CBS Interactive, Popular Science and WSJ Live. 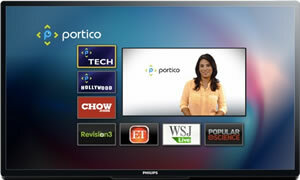 Distribution will begin through Philips internet-connected Smart TV’s in the United States. The California-based company, which is being headed up by network executives from media juggernauts like MTV, Black Arrow, NBC and Netflix, utilizes a cloud technology called ActiveVideo to deliver full-length episodes of TV shows. Content is grouped into several categories, including food, science, entertainment and technology. “Good television — the television viewers love — is an art, not an algorithm,” said Net2TV CEO Thomas Morgan in a released statement. “We’re building television programming that lets viewers enjoy smart TV just like they do traditional television.” The company is also working on recruiting other programmers like Discovery’s Revision 3, while working with current partners to develop original programming that will appeal to all audiences. In addition to accessing original first-run programming, users will also be able to watch the popular WSJ Live broadcast produced by The Wall Street Journal.